Today I joined a group from the Natural Heritage Land Trust on a hike to Westport Drumlin State Natural Area. This is part of an SNA called the Empire Prairies, which comprises three small remnants of what was once the vast (>7000 acres) Empire Prairie, which extended all the way into Columbia County to the north. The Westport Drumlin SNA contains 15 acres of dry to dry-mesic prairie plus a small bur oak savanna. 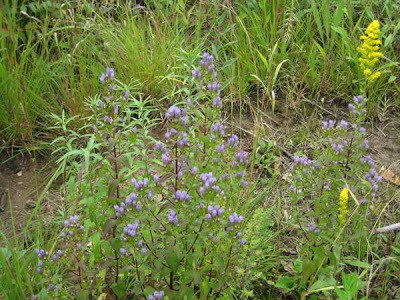 The prairie contains over 100 dry site species, but is most noted for its substantial population of prairie bush clover (Lespedeza leptostachya), a Federally-threatened and State-endangered species. The photo above shows the group examining a small population of the spectacular downy gentian (Gentiana puberulenta), a colorful gentian which is a late-blooming species. Although the Westport Drumlin is owned by the state, most of the surrounding land, including the access (for which an easement exists) is private land. Because of this, the Natural Heritage Land Trust has become active in acquiring some of this surrounding land. The Trust already owns about 70 acres, and is negotiating to acquire more land. Although the focus of the trip today was on the prairie vegetation, I was particularly interested in observing the fine bur oak savanna that is present on the lower southeast slope. 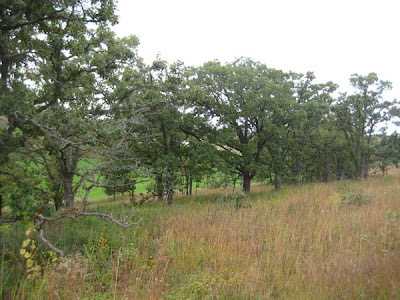 Although not large, this savanna has a substantial number of large, open-grown bur oaks. Although the savanna is not large enough to have much of a savanna understory flora, the savanna is surrounded by a large patch of prairie grasses, including big and little bluestem and Indian grass. For the last two years we have been restoring what we call the East Basin. This is a 5 acre area that faces south and southwest and slopes down from the Ridge Prairie. Old air photos had shown that this was completely open in the late 1930s. It was probably a prairie remnant that was lightly grazed (because it was so far from the barn, and surrounded by land of other owners). Using my extensive series of air photos, I watched as this area gradually filled in with trees. By the time we started restoring it in 2007, it was fully wooded. However, the trees were undesirable: walnut, elm, black cherry, etc., plus a large clone of quaking aspen (which were girdled in May 2008)..
We plan to plant the East Basin to dry mesic and mesic prairie in November. Before then we will burn all the piles of aspen, adding to them all the wood that is lying on the ground. We'll probably be doing this in early November, hopefully with help from some volunteers. 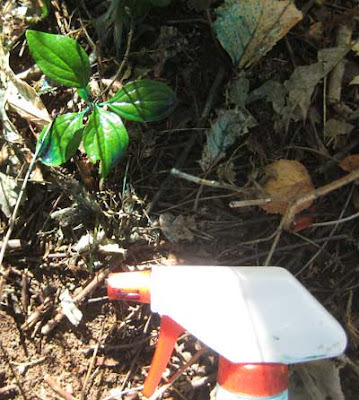 (All of the understory vegetation has been sprayed twice with glyphosate.) At present, we are very actively collecting seed. We plan to have at least 100 species to plant. In the hill country of southwestern Wisconsin, grazing was what you did with land that was too hilly to plow. Most of this land was savanna, although there was also lots that was prairie. This is probably what the East Basin was, since there was not a sign of a tree in the 1937 air photo. Stiff gentian (Gentianella quinquefolia) is another late bloomer. 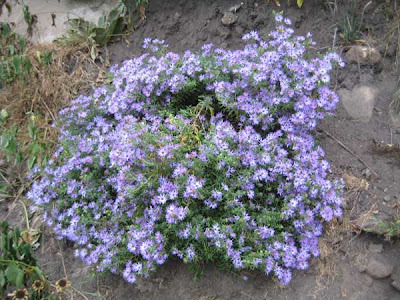 It is not as showy as aromatic aster, but it is still colorful and a desirable member of any prairie or savanna. 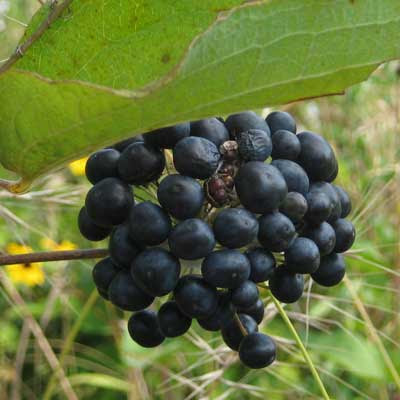 In Wisconsin it is found almost exclusively in the southern part of the state, mainly in calcareous areas. When we started restoration, our native population was mostly restricted to the County F roadside, although there was also a small population in a tiny prairie remnant near the Rocky Overlook. Probably because of its need for calcareous sites, it has a high Coefficient of Conservatism of 7. According to Cochrane and Ilitis, it is a "winter" annual, or perhaps a biennial. Thus, its continued presence at a site depends on seed production and new growth. Because of this, we are always careful when we collect seed to leave plenty behind. Most people would say you should not collect more than 30% of the population. Of course, you always miss a lot of seed, so it would be hard to eradicate it just by collecting. The photo here is from some plants I found in the White Oak Savanna (Unit 12A), while doing a routine survey. These were almost certainly planted there from seeds collected along County F. According to my check list, this species is now present in most of our savanna areas, as well as our planted prairies. It is never widespread in any of these areas, but it is usually found in small clusters, such as shown in the photo here. Because of the fairly large area of Prairie du Chien dolomite, we have substantial calcareous areas at Pleasant Valley Conservancy, providing good habitat for a number of relatively uncommon species, such as stiff gentian. 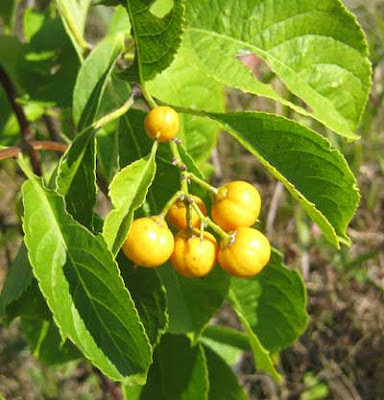 However, buckthorn also flourishes in calcareous areas! Aromatic aster (Aster oblongifolius) is now in full bloom. In Wisconsin this handsome aster is found in a restricted area in dry, primarily calcareous, sites in the southwest part of the state. According to Cochrane and Iltis, it is now fairly rare, less common than its distribution map in the state suggests. It has the relatively high Coefficient of Conservation of 6. As far as we can tell, this species was not present at Pleasant Valley Conservancy before restoration began (but it "should" have been). We obtained seed from a Dane County source and raised plants in the greenhouse. They transplanted beautifully and have flourished. The photo here is of a single plant that Kathie planted on the steep road bank near our parking area. It is obviously doing well. It has also done well in several of our planted prairies. Because this is such a showy plant, it is popular with gardeners, especially because it provides a real splash of color in the late fall when most plants are finished flowering. Folks may be bored hearing about sweet clover. I discussed it a lot this summer, but unfortunately, there is also a fall season. We find two types of fall sweet clover plants: 1) new plants arising from the seed bank; 2) resprouts from stems that had been cut. The resprouts are especially insidious. At Black Earth Rettenmund Prairie, where we had some large sweet clover infestations, we used Stihl brush cutters with triangular blades to cut the plants. The idea was to cut them when they were in full bloom, with the hope that since they were biennials this would eliminate them. Unfortunately, a lot of the cut stems resprouted and are now flowering. The photo at the left shows a typical stem. You can see the thick cut stem (dark brown), plus at least "four" new shoots. Although not shown, each of those shoots has a few flowers, which will likely go on to make seeds. Ughhh! It seems that the theory about eliminating sweet clover by cutting has some flaws. In some previous years, we did not have this problem. Perhaps our timing was wrong this year? Or perhaps the cool, wet weather we had this summer has had an effect. Whatever, our work is obviously not done yet. Fortunately, most of the sweet clover at Rettenmund Prairie was pulled rather than cut. Only where we had major infestations did we resort to cutting. This was described in detail in the post that is linked here. So, at our volunteer work party last Sunday, before starting seed collecting we spent an hour and a half pulling sweet clover. And because many of these plants would go on to make seeds if left on the ground, we bagged them all and disposed of them off site. You do what you have to do! Although we have been collecting seeds of a few plant species since June, the big seed collecting push is just beginning. From now until early November, we'll be collecting seeds every day we are in the field, as different species become "ready". Many of us first learned how to collect seeds from Mark and Sue Martin at the Madison Audubon Society's Goose Pond Sanctuary, and yesterday we started again. The photo shows the group getting their orientation. In addition to the "regulars", there were quite a few new participants. Some of these people are interested in planting their own prairies, but others just want to volunteer, enjoying the chance to do something constructive in the outdoors. Seed collecting is one of the more enjoyable activities involved in ecological restoration. 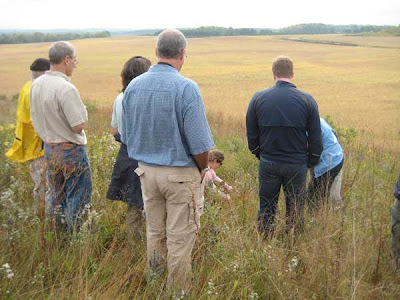 Goose Pond Sanctuary has over 500 acres of planted prairies, one of the largest prairie areas in southern Wisconsin. 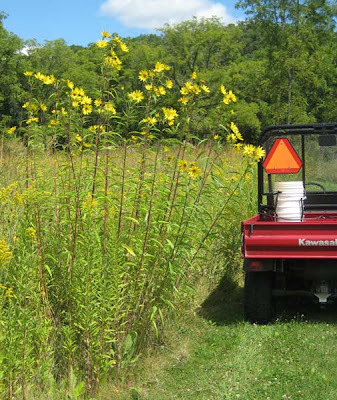 Prairie planting began in 1976, with what is now called the Bicentennial Prairie, and picked up steam when Mark and Sue Martin became the resident managers in the 1980s. The area was part of the very large (over 5000 acres) Empire Prairie that extended north from Lake Mendota for many miles. Unfortunately, this was prime agricultural land (the U.W. Madison Experimental Farms are nearby) so that most of the prairie was destroyed a long time ago. There are just a few small prairie remnants left. Which species are collected on any given day will depend on what the growing and seed formation conditions have been like. Although there is a certain regularity with each species, there is always a lot of year-to-year variability. Yesterday we collected tall meadow rue (Thalictrum dasycarpum) prairie cinquefoil (Potentilla arguta), glade mallow (Napaea dioica), and flowering spurge (Euphorbia corollata). This is the time of year when berries are ripe on a lot of berry-forming plants. Many of these are colorful and stand out. Among those I saw today were spikenard (Aralia racemosa), bittersweet (Celastris scandens), prickly ash (Xanthoxyllum americanum), and carrion flower (Smilax herbacea). Photos of the last three are shown here. Carrion flower does not have an especially attractive name, but its clusters of intensely blue-black berries are fairly attractive. I once had a florist ask me where he could find plants that he could collect, as he thought they would be attractive additions to floral arrangements. Carrion flower is a monocot, in the cat-brier family. According to Cochrane and Iltis, carrion flower is very rare in Wisconsin. That certainly is not our experience, as it is widespread at both Pleasant Valley Conservancy and Black Earth Rettenmund Prairie. It is a vine but if there is nothing vertical nearby it will sprawl out on the ground. 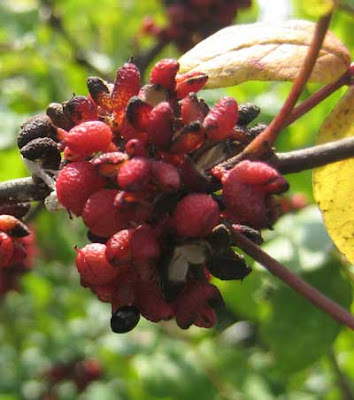 Prickly ash is a native shrub that is a fierce clone-former and potentially invasive. Even though it is native, we consider it undesirable because of its tendency to dominate an area. (Interestingly, it is considered ENDANGERED in several southern and eastern states!) Its berries are favorites of giant swallowtail butterflies as well as some bird species, so we have intentionally left a few clones at the edges of the Conservancy. 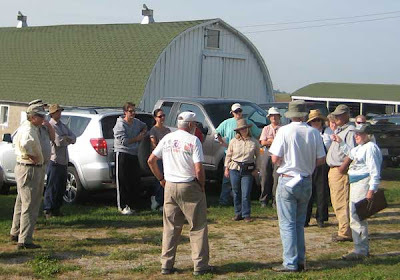 Today we conducted our annual Labor Day field trip at Pleasant Valley Conservancy. This year we had the largest attendance ever, 35 people. Perhaps it was the very fine weather? The photo above shows Kathie leading the group along the Diagonal Trail across the south slope at the end of the trip. We changed the route this year. In the past, we have gone "up" the Diagonal Trail at the start of the trip, and then finished by walking through the Valley Prairie. This year we "started" at the Valley Prairie and ended along the south slope. This latter route gets folks up onto the ridge by a more gentle route. The Diagonal Trail is not normally open to the public. It is narrow and somewhat rutted, and requires careful attention to where you put your feet. 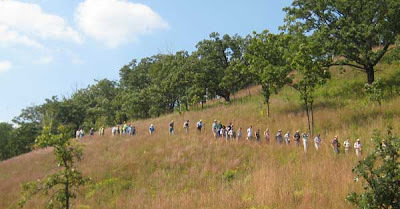 We reserve it for special field trips, since it does give one the chance to see the little bluestem short grass prairie close up. There aren't many little bluestem prairies in southern Wisconsin, and certainly not any as large as ours. We have been happy that photographers are discovering Pleasant Valley Conservancy, and some of them have been putting up their photos on photo sharing sites. The technique I use to process most of the shots (at least the ones that are really colorful, and appear painted) is kind of a complicated one. For shots like “Final Light”, I take three or more shots on a tripod, and underexpose and overexpose some of them so that in a series of shots I can capture the full dynamic range of light in a scene. Digitally these separate exposures are combined, so that no over-exposed (or blown-out) areas exist, and no black shadowed areas exist. Then I do a bunch of post-processing work in Adobe Photoshop to give it that painted look. The shots look much much better at full resolution, as all shots are taken at 12-megapixels. 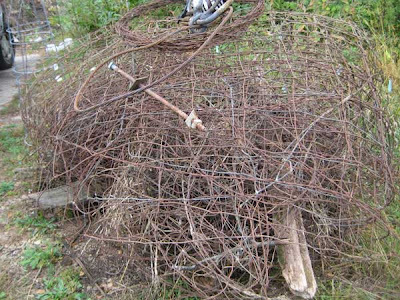 I keep trying to develop the best way of dealing with small buckthorns. These are the ones that either arise from the seed bank, or are resprouts from underground roots or rhizomes. It takes most of the summer for these to grow large enough to find easily, and to think about controlling with herbicide. In past years, we have waited until early October, when most of the native vegetation has started to senesce, the idea being that then the natives won't be affected by the herbicide. This mostly works, but by then the buckthorn stems are large enough that one needs to use a backpack sprayer. This requires a lot of herbicide, and not all of it can be confined to the buckthorn plants. This year we are starting earlier, when most of the buckthorn plants are small, and are using spray bottles. I am using a two-fisted approach: one spray bottle with aqueous Garlon 3A for foliar spraying of the very small plants (with blue dye); the other spray bottle with Garlon 4 in bark oil for basal bark treatment of the larger plants (with oil-soluble red dye). By larger plants, I mean plants that are still fairly small, mostly knee-high. I walk through the area and hone in on every buckthorn plant. These are fairly easy to spot because their leaves are dark green, somewhat shiny, and have a characteristic structure. The small ones, that will be foliar sprayed, need only a couple of brief spritzes from the bottle. The photo to the left shows the situation. The blue dye helps to keep track of which plants have been sprayed. Because it is not necessary to control the spritz very much, I can hold this spray bottle in my left hand. Unfortunately, most plants are too large for foliar spraying, and must be basal barked. To do this, one must grab the top of the stem and pull it back so that the base is exposed. I can do this with my left hand while holding the foliar spray bottle. 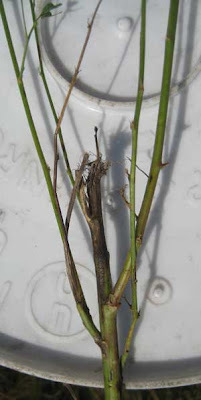 The second photo to the left shows a stem that has been treated. The pattern of the oil itself can be seen, and the red dye seems to help. The bit of spray that gets on the leaves also helps to control which plants have already been sprayed. This approach works but is tedious. I would only suggest it in areas where buckthorn is not too dense. 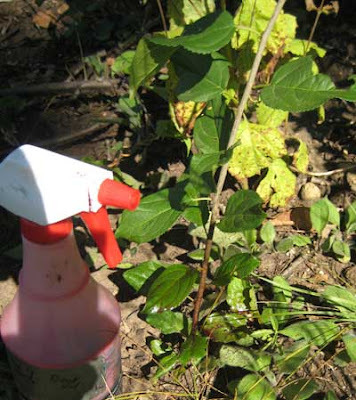 If one has a large patch of solid buckthorn, I would recommend foliar spraying with a backpack sprayer, but waiting until October, when the native vegetation has senesced. The basal bark treatment can also be done at the same time on sumac, prickly ash, or any other woody plant. In the area we were working in today, there was only scattered sumac, all of which were treated. This sort of work is what I call "stoop labor". It is not fun, but it does get the job done, and without disturbing significantly the native vegetation. In fact, I have noticed that new natives are becoming established in these areas where buckthorn was once dominant. I have been spending quite a bit of time lately seeking out various sunflower species at Pleasant Valley Conservancy. Since they are all clonal species, and either actually or potentially invasive, they are of considerable importance. Most of our sunflower clones are of the species Helianthus divaricatus, which goes by the common name of woodland sunflower. 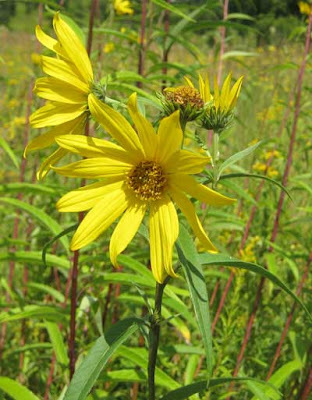 However, we have always had a small amount of Helianthus grosseserratus (sawtooth sunflower) in our wetland. This never bothered me because it seemed like it was staying put. Recently, however, sawtooth sunflower has started to spread. I have now found four relatively small clones in the Valley Prairie. These were definitely not planted there, and since this prairie is now in its seventh growing season, its presence is quite a surprise. The photo above shows what one of these four clones looks like. Admittedly, it is not large, but since it spreads by underground rhizomes, it has the capability of moving into already established prairie. Near to this particular clone is a fine population of Gentiana alba, a State Threatened species. I'm not too interested in losing that. You can tell that sawtooth sunflower is a potential problem since it has a Coefficient of Conservatism of 2, pretty far down the scale. However, a quick search of the literature has not uncovered any suggestion that it is able to invade planted prairies, as has happened here. I plan to keep an eye on it for next year. I have installed a permanent marker at each of these clones, and have recorded its GPS coordinates. We'll see!